The Egypt Economic Development Conference (EEDC) that was held in the resort town of Sharm el-Sheikh on March 13-15 that attracted delegations from 90 countries has become a kind of plebiscite on the policies of Egyptian President Abdel Fattah. This very conference attracted a total of 3,500 participants, including senior authorities from 22 states. According to Egypt’s Prime Minister Ibrahim Mahlab, within those three days Egyptian authorities have managed to attract 60 billion dollars worth of investments. 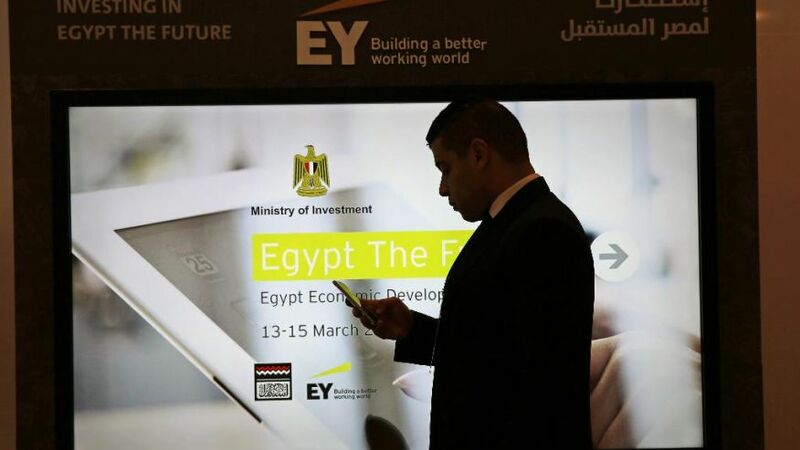 Additionally, the Gulf monarchies – Saudi Arabia, UAE and Kuwait – will provide Egypt with 12.5 billion dollars to assist in the development of the Egyptian economy. Each of the above listed states will allocate four billion dollars to Cairo in investments on top of three billion dollars provided to the Central Bank. This creates perfect preconditions for the further development of the Egyptian economy, along with suggesting that after the death of Saudi Arabia’s king the Gulf States will carry on with developing cooperation and further ties with Egypt. In addition, during the days of the conference Egyptian authorities have manged to sign a number of memorandums of mutual understanding with companies from around the globe. The total worth of signed contracts alone would amount to 175.2 billion dollars. In particular, the German conglomerate Siemens signed a 4 billion euros contract on the construction of a thermal power station equipped with steam and gas generators with a power capacity of 4.4 gigawatts and 2 gigawatts respectively, along with other projects in the Red Sea a total worth of 6 billion euros. In turn the English oil giant BP is going to provide Egypt with 12 billion dollars in investments. At the height of the conference, Egypt announced its ambitious project of building a new administrative and financial capital, that must be built some 45 kilometers to the east of Cairo. Egypt’s Minister of Housing Dr.Mostafa Kamal Madbouli Mohammed announced that the present population of 18 million people in Cairo will double in the next forty years, reaching a staggering 40 million by 2050 which would make business in Cairo a challenging task. Therefore a new capital will be established, occupying 700 square kilometers between Cairo and Suez, on the sandy shore of the Suez Canal. The terrain occupied by the new project will be 12 times larger than Manhattan, three times larger than Washington, and the new capital will have a new international airport and an amusement park four times larger than Disneyland in California. As it was further explained by the minister, the new city will offer “a better life” to its estimated five millions future inhabitants, due to numerous “green spaces”, and other open areas . All state institutions, including the Parliament, the presidential palace, ministries, foreign embassies and so on, will be transferred to this new capital. The first phase of this project must be finished within the next 5-7 years at the cost of 42.9 billion euros. Against this background, many experts pointed out that the United States sent the Secretary of State John Kerry to Egypt “with empty hands”, allowing him to only state US intentions of allocating 650 million dollars out of the previously provided annual aid of 1.5 billion dollars (1.3 of which were spent on military cooperation), that was frozen after the ousting of President Mohamed Morsi in 2013. The only bright side in the bilateral relations between Cairo and Washington is the fact that US Apache helicopters have been recently shipped to Egypt in order to support it in its fight against extremists in the Sinai. In this regard, no one was surprised by the extremely short and boring speech that was made by Kerry at the conference. He was entitled to speak after fifteen other speakers. The US Secretary of State must have been truly irritated by such treatment, and confined himself to saying that the United States would assist Egypt in its quest for security and peace. Thus, while being a vital link between the Arab world, Africa, Asia and Europe, Egypt in the coming years has the chance of becoming one of the new champions of the world economy. The geographical position of Egypt, its huge ports on the Mediterranean (Alexandria and Port Said), Red Sea (Suez and Sharm el Sheikh) are an excellent economic backbone for this new geopolitical role. The Egyptian government is planning to expand the Suez Canal with a parallel one to resolve the problem of the ever increasing shipping traffic. The plans for achieving stable economic growth are clearly attainable for Egypt due to the diversified national economy and the active 90 million people of this country, the average age of which is 24 years. Despite a number of security challenges that have been keeping Egypt’s economy from growing, its agricultural (14% of GDP), and mining (40% of GDP) capabilities along with a fairly large human services and tourism sector (46% of GDP) are clearly able to provide the country with much needed economic growth. The support that has been demonstrated by the Gulf monarchies for Egypt has without a shadow of a doubt been motivated by its willingness to get actively involved in the fight against ISIL. In addition, those states do understand that the Egyptian army – is one of the strongest in the Arab world, therefore it can become the backbone of the fight against radical Islamists and other threats in a joint Arab military contingent, that is to be established at the end of March at the upcoming Arab League summit. In this regard, the statement that Egypt’s President Abdel Fattah el-Sisi made in February on the creation of such a force couldn’t be appreciated enough by Saudi Arabia, UAE, Kuwait and Jordan. But they wouldn’t be providing Egypt with tens of billions of dollars without a hidden agenda behind this “act of kindness”, considering the Gulf monarchies have been facing dangerous developments in Yemen lately, so a certain hope that Egypt would lend support in this matter was surely included. In addition, for Riyadh to obtain all possible support from Cairo in Yemeni affairs, it has to make sure it has done its best to smooth over the recent Egyptian initiative in the UN Security Council for its proposed international military intervention in Libya against ISIL militants that was recently blocked by Qatar and Saudi Arabia. It should be recalled that initially this initiative was supported by the KSA, UAE and France. However, the contradictions between Egypt and Saudi Arabia over the military operation in Iraq regarding Mosul affected the situation. Egypt refused to go for the Mosul operation due to the fact that the coalition failed to provide it with a guarantee that it would be carried out against the Muslim Brotherhood as well. Then the American administration declared the fight against the Houthis under the influence of Riyadh, but yet argued that the coalition shouldn’t fight against the Muslim Brotherhood, since there would be no one to protect the interests of the Persian Gulf monarchies in Yemen without this group. And for these reasons, Washington proposed Cairo instead of pursuing international intervention in Libya, to instead seek a solution through political means, linking the settlement of the issue with Egypt’s position on the “Muslim Brotherhood”.